Over the past few years, a growing number of central banks have employed negative interest rate policies (NIRP) to provide additional monetary policy stimulus. The central banks implementing NIRP are now charging – instead of paying – commercial banks for their excess reserves, effectively taxing banks for hoarding cash and, in principle, encouraging them to boost lending. The use of NIRP aimed to show central banks’ resolve to meet their policy objectives, as the perceived zero lower bound constrained their ability to commit to additional policy easing (Goodfriend 2016). In particular, the main motivation for the implementation of NIRP by the ECB, the Swedish Riksbank, the Bank of Japan, and the Central Bank of Hungary was the need to stabilise inflation expectations and support growth. In the case of the Danmarks Nationalbank and the Swiss National Bank, an immediate motivation was the need to respond to currency appreciation and capital inflow pressures. For central banks implementing quantitative easing (QE) policies, two additional considerations were the narrowing pool of assets eligible for their purchase programs and the possibility of diminishing returns from QE. 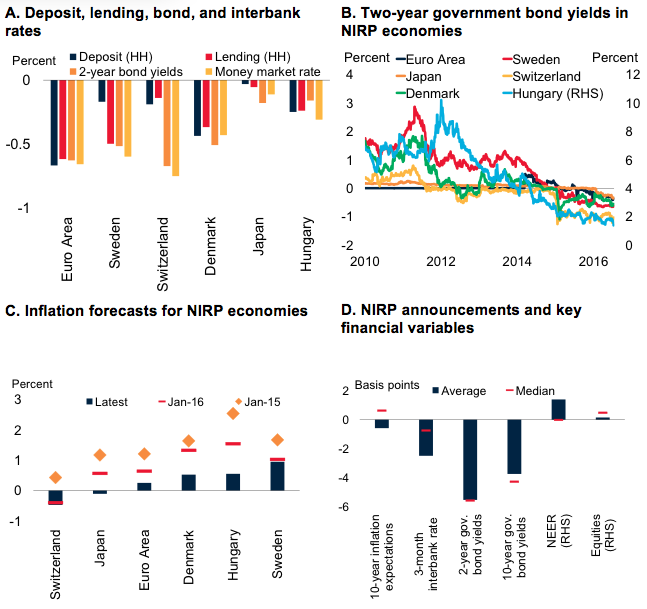 How do transmission channels of monetary policy operate under NIRP? How have key financial variables evolved since the introduction of NIRP? How could NIRP affect financial stability? Transmission channels of monetary policy under NIRP are conceptually analogous to those under conventional monetary policy. Specifically, NIRP are expected to be transmitted mainly through the interest rate, credit, portfolio, and exchange rate channels. However, complications associated with these channels under NIRP could limit policy effectiveness, particularly if they have adverse effects on the financial sector. For example, in the case of the interest rate channel, commercial banks may hesitate to impose negative rates on depositors in order to prevent a loss of their deposit base. This downward rigidity in retail deposit rates may either limit the pass-through to lending rates, as banks seek to maintain interest margins, or adversely affect profitability, which could weaken the transmission of monetary policy (Cœuré 2016, Waller 2016). Eventually, NIRP could have an adverse impact on credit growth if banks are inclined to charge higher lending rates or fees to cover losses, or if a diminished capital base make them more reluctant to lend. Regarding portfolio balance effects, a decline in short‐term interest rates in negative territory should increase the demand for longer duration and higher-yielding assets, which could in turn support investment and eventually growth (Bernanke 2016). However, NIRP, as other unconventional monetary policies, could potentially distort asset valuations and lead to risks of asset price bubbles, if sustained over a prolonged period. NIRP can be expected to contribute to domestic currency depreciation, and could help promote export-led recoveries for individual countries; however, if many countries simultaneously undertake NIRP, these could lead to beggar-thy-neighbour policies of competitive devaluations. Since the introduction of NIRP, key financial variables have evolved broadly as implied by the standard transmission channels of monetary policy. For example, policy rate cuts to negative levels have generally been reflected in corresponding declines in money market rates and short-term government bond yields (see Figures 1A and 1B). In turn, the fall in bank wholesale funding costs has helped lower lending rates, but to varying degrees across countries. The decline in rates on new loans has been particularly notable in the Eurozone (Viñals et al 2016, Jobst and Lin 2016). However, other policy initiatives render the specific contribution of NIRP difficult to isolate, while the pass-through in some NIRP countries has been more limited. Contrary to the objectives of NIRP, inflation expectations have continued to decline in most NIRP economies (see Figure 1C). Currencies of economies implementing NIRP have on average depreciated since the corresponding policy decisions, with the exception of the marked appreciation of the Japanese yen and Swiss franc. Sources: ECB, Bank of Japan, Statistics Sweden, Swiss National Bank, Danmarks Nationalbank, Central Bank of Hungary, Haver Analytics, Bloomberg, World Bank. Notes: For details, see Arteta et al (2016). An event study assessing the immediate market reaction to NIRP indicates that money market rates and sovereign bond yields fall on the day of the policy announcement, whereas inflation expectations do not change much, while currency movements vary across NIRP economies (see Figure 1D). NIRP could pose specific risks to financial stability, particularly if rates go substantially below zero or if NIRP are employed for a protracted period of time. Adverse outcomes could include the erosion of profitability of banks and other financial intermediaries and excessive risk taking (Hannoun 2015). Recent research points to the adverse effects of low interest rates on net interest margins (Claessens et al 2016). However, available data so far provide inconclusive evidence about the impact of NIRP on bank profitability. 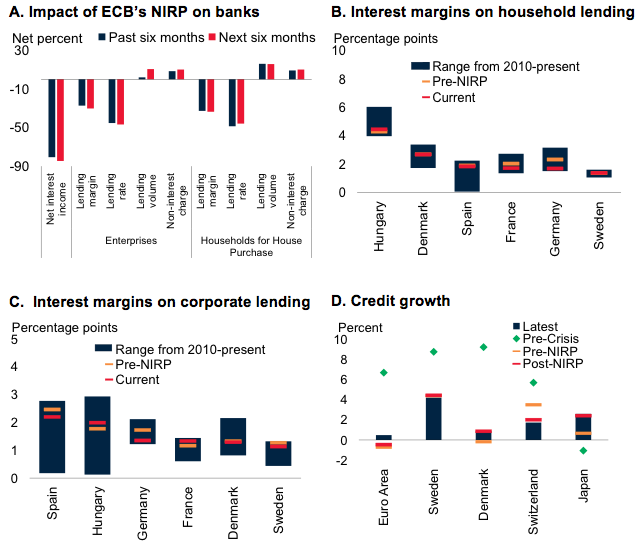 While some bank surveys indicate a perception among survey participants that NIRP are having an adverse impact on bank profits, bank lending margins remain within post-crisis ranges and credit growth has improved, albeit sluggishly in most cases (see Figure 2). Sources: ECB, Bank of Japan, Swedish Riksbank, Swiss National Bank, Danmarks Nationalbank, Central Bank of Hungary, Bloomberg, Haver Analytics, and World Bank. Notes: For details, see Arteta et al (2016). With the rising share of negative-yielding debt securities, pension and life insurance companies could eventually struggle to generate adequate returns to meet their long-term liabilities. Like other unconventional monetary policies, NIRP could also encourage excessive risk-taking, which could contribute over time to the formation of asset price bubbles. However, increases in house and equity prices have thus far remained moderate in most NIRP economies. In a challenging macroeconomic environment, NIRP could help provide additional monetary policy stimulus, as long as policy interest rates are only modestly negative and they do not stay negative for too long so as to avoid adverse effects on the financial sector. As such, these policies have a place in the policymaker’s toolkit but they need to be handled with care to secure their benefits while mitigating risks. The benefits of unconventional monetary policies, including NIRP, might diminish over time, and the risks associated with their aggressive use point to the need for a broader mix of macroeconomic policies (Kose and Terrones 2015, World Bank 2016). Specifically, monetary policy should be complemented by fiscal and structural policies that could support aggregate demand and help counter adverse shocks in the future (Cœuré 2016, Sims 2016). Arteta, C, M A Kose, M Stocker and T Taskin (2016) “Negative interest rate policies: Sources and implications”, CEPR, Discussion Paper 11433. Ball, L, J Gagnon, P Honohan and S Krogstrup (2016) “What else can central banks do?” VoxEU.org, 2 September. Bernanke, B (2016) “What tools does the Fed have left? Part 1: Negative interest rates”, Brookings Institution (blog), 18 March. Buiter, W (2009) “The wonderful world of the negative nominal interest rates, again”, VoxEU.org, 4 June. Claessens, S, N Coleman and M Donnelly (2016) “Low interest rates and banks’ net interest margins”, VoxEU.org, 18 May. Cliffe, M (2016) “Negative rates, negative reactions”, VoxEU.org, 26 February. Cœuré, B (2016) “Assessing the implications of negative interest rates”, Speech at the Yale Financial Crisis Forum in New Haven, 28 July. Goodfriend, M (2016) “The case for unencumbering interest rate policy at the zero lower bound”, Jackson Hole Economic Policy Symposium, Federal Reserve Bank of Kansas City, Jackson Hole, Wyoming, 26-27 August. Hannoun, H (2015) “Ultra-low or negative interest rates: What they mean for financial stability and growth”, Speech at the Eurofi High-Level Seminar, Riga, 22 April. Jobst, A and H Lin (2016) “Negative interest rate policy: Implications for monetary transmission and bank profitability in the Euro area”, IMF, Working Paper: 16/172. Kose, M A and M Terrones (2015) Collapse and revival: Understanding global recessions and recoveries, IMF, Washington, DC. Sims, C (2016) “Fiscal policy, monetary policy and central bank independence”, Jackson Hole Economic Policy Symposium, Federal Reserve Bank of Kansas City, Jackson Hole, Wyoming, 26-27 August. Viñals, J, S Gray and K Eckhold (2016) “The broader view: The positive effects of negative nominal interest rates”, IMF, IMFdirect, Blog, 10 April. Waller, C J (2016) “Negative interest rates: A tax in sheep’s clothing”, Federal Reserve Bank of St Louis, On the Economy (blog), 2 May. World Bank (2016) “Global economic prospects: Spillovers amid weak growth”, January.